Cut more trees. Cut harder woods. Cut ground level. 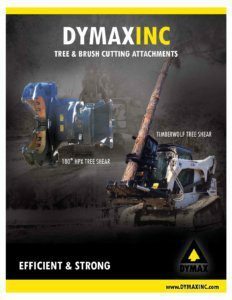 The Dymax Tree Shear is the king of tree shears and provides the strongest design for cutting woods of all types including hardwoods. Ideal for biomass clearing operations and applications for removing diseased trees, fire prevention methods, water conservation, power line utility tree removal and all general clearing operations where trees of all sizes and shape need to be removed. Available for Excavators, Backhoe Loaders and Skid Steer Loaders.